The shoulder is the most active joint in the human body, and as a result of its constant activity and the overhead arm motions, it’s highly susceptible to developing severe shoulder conditions, such as SLAP tear and rotator cuff tear. These shoulder conditions can greatly impact the person’s lifestyle and for this reason, it’s important to address them the moment the first symptoms are shown. Visiting an experienced and skilled shoulder is the first step towards successful recovery. When Christopher Baginski flew in from Arizona for an appointment with Dr. Armin Tehrany, he was surprised to meet a doctor who cared for his patients as honestly as Dr. Tehrany did. 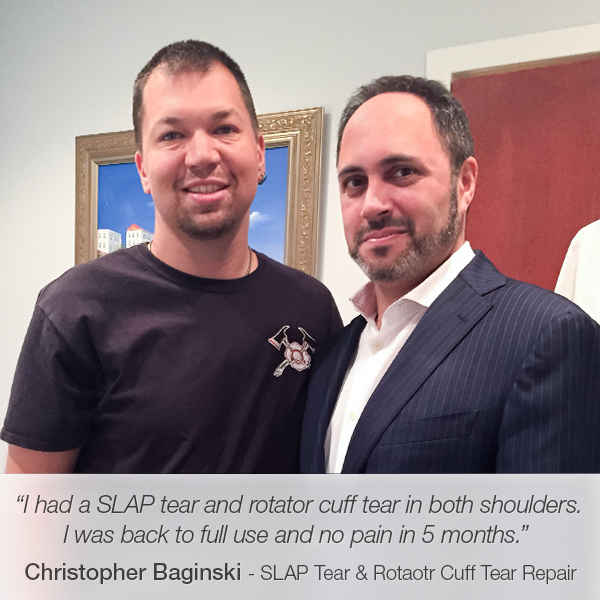 His first visit to Manhattan orthopedic Care was because of a SLAP tear which Dr. Tehrany successfully repaired. As a result of Dr. Tehrany’s professionalism and exceptional bedside manners, Christopher flew to New York once again, this time for his other shoulder. The reason for his second visit was a rotator cuff tear that limited his mobility and cause a great amount of pain. The second visit was even more pleasant than the first one since Christopher had already developed complete trust in Dr. Tehrany’s knowledge and skills, and felt comfortable proceeding with the rotator cuff tear surgery with Dr. Tehrany as his shoulder surgeon. Excited that the recovery took less time than other doctors predicted, Christopher decided to share his super positive experience with Dr. Tehrany and wrote a candid Google review that truly touched us. “I have had both shoulders repaired by Dr. Tehrany, and he has been my only surgeon. However, when I speak to other people who have had lesser injuries repaired and I’m full strength in lesser time I’m amazed! I’ve had a SLAP tear in both shoulders as well as rotator cuff repaired, and I was back to just about the full use and no pain in 5 months. My range of mobility is great! !